“Faster,” Ernie muttered, and gave his horse another kick. “What’s a bikalis?” Jess yelled over the beat of the horses’ hooves. “Can we outrun it?” Ben asked. There came another rumble, now clearly a distant bestial roar, closer. The Stuttering Bard of York is a lighthearted tale of adventures and mishaps, starring a stuttering farmer who wants to be a bard, a warrior princess with a horse called Mankiller, and a pacifist wizard who isn’t very helpful when it comes to saving the world. Ben Transom is a simple farmer who sings off-key to his horse and wishes he were a bard. But when a goblin raid from the Shiddow Mountains destroys Ben’s simple life, he is sent to petition the king for justice and is thrown into an adventure greater than he every dreamed. Along the way, Ben meets the warrior-princess Jess and the pacifist wizard Ernie. Soon they learn that the evil wizard Rimmah has enslaved Jess’s parents and seeks to conquer the entire kingdom of Tarn, and Ben finds himself caught up in events more dangerous than he ever imagined. Although Ben has a weak understanding of economics and public restrooms, it is his kind and honest nature that keeps the band together despite goblins, rogues, and creatures far more foul that Rimmah sends their way. He is just a simple farmer, but he soon discovers that both the princess and the wizard are depending on him to get them to the city of Galdoron and attempt a daring rescue of the king and queen. Interested? You can read a sample of The Stuttering Bard of York online. 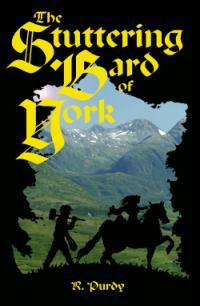 You can download a PDF copy of The Stuttering Bard of York. Remember to pass it around to all your friends. You can purchase a good old fashioned copy of the book for yourself, or to give to someone else. Finally, when you’re finished, please spread the word.